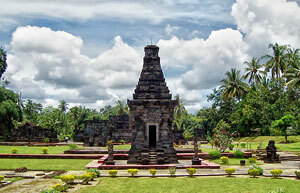 Penataran is the largest and most important Hindu temple complex in East Java. It lies just 10 Kilometers north of Blitar on the lower slopes of Mt. Kelud. It had said that this temple was dedicated to the Siva and use for at least three hundred years, from the 12th to 15th centuries. Most of the buildings, which can be seen today, however, were constructed during Majapahit's golden century. The layout of the temple is similar to that found in the Balinese Pura today. A number of small buildings are scattered within a sacred, walled enclosure, with the largest and most important temple at the rear of the complex, Hindu legends, among them the Ramayana epic, are carved in relief on the temple walls and terrace foundations. Penataran tourism is the supporting tourism area near the Penataran Temple. In this area, we can find swimming pools for adult and children, also water bike pool, artificial lake and children playground.